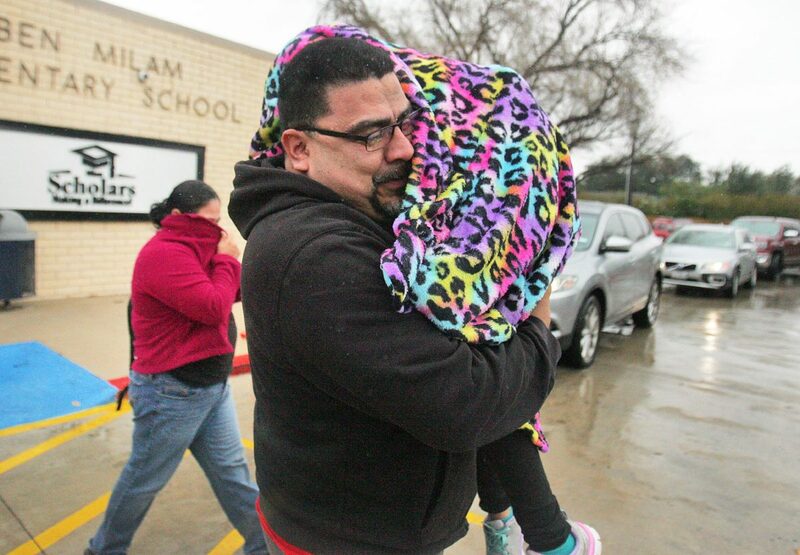 Edwardo Ochoa carries her daughter Maria Ochoa, 5, as children and parents brave the cold weather while leaving at the end of school day at Ben Milam Elementary Tuesday, January 16, 2018, in McAllen. The University of Texas Rio Grande Valley will begin classes Wednesday at 9 a.m. All earlier classes are canceled. 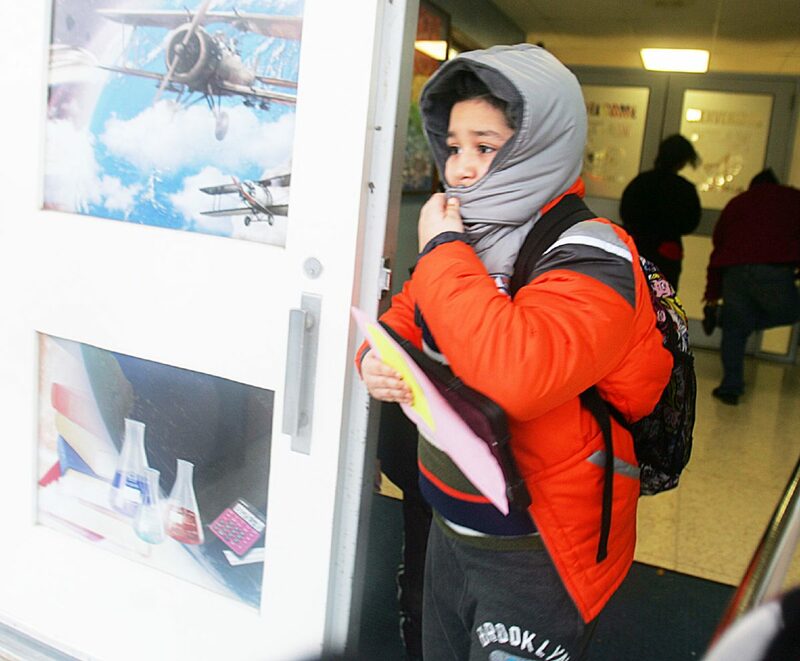 The Vaquero Express bus service will begin operation at 7: 30 a.m.
Ethan Rodriguez, 9, covers his face as he walks out of Ben Mlam Elementary school as children brave the cold weather at the end of the school day Tuesday, January 16, 2018, in McAllen. 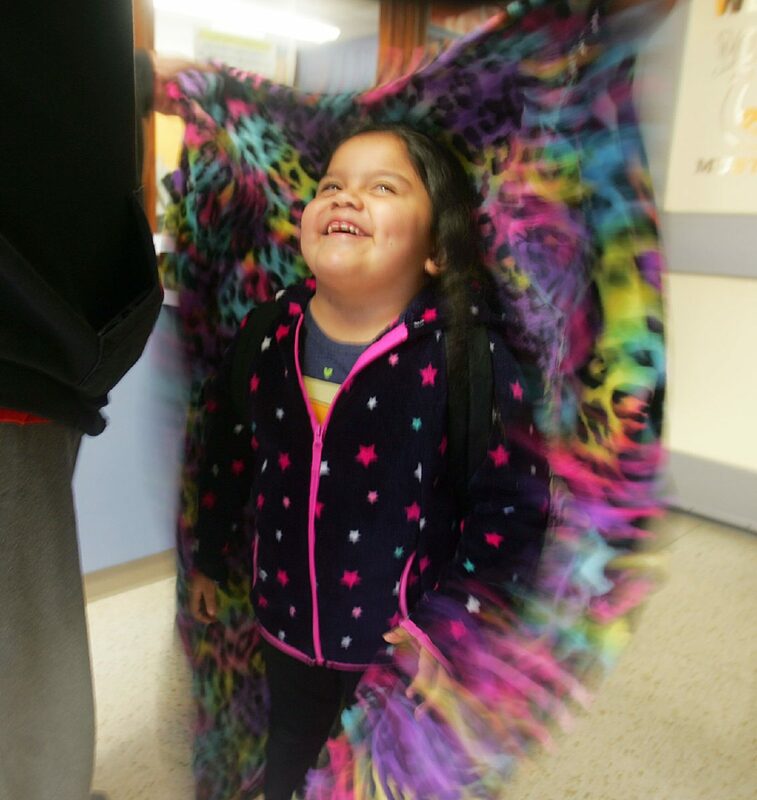 Maria Ochoa, 5, smiles as she is covered by a blanket by her father Edwardo Ochoa as children and parents brave the cold weather while leaving at the end of school day at Ben Milam Elementary Tuesday, January 16, 2018, in McAllen. 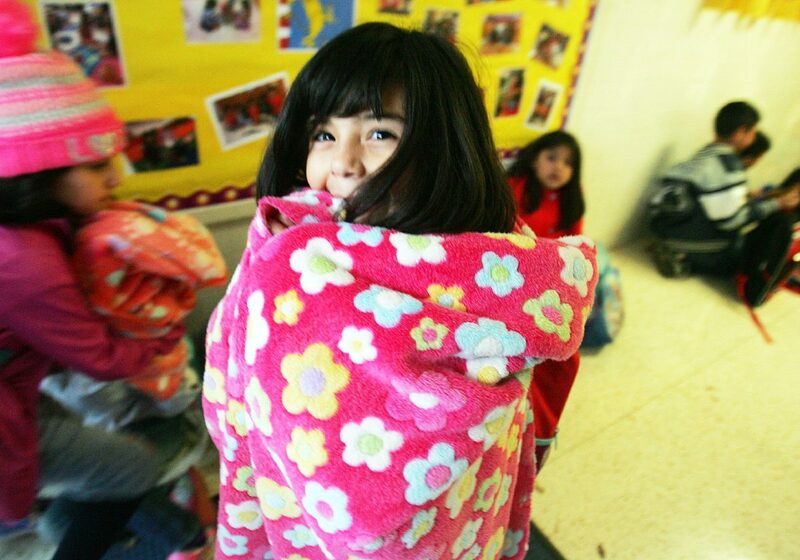 Daniella Sanchez, 7, wraps herself in a blanket before leaving Ben Milan Elementary to by picked up as children brave the cold weather at the end of school day Tuesday, January 16, 2018, in McAllen. La Joya ISD will have delayed start on Wednesday, with elementary schools beginning at 9 a.m., middle schools at 9:30 a.m. and high schools at 10 a.m. Bus pick-up times will begin 30 minutes before the start of the delayed time. Staff and employees should report to work at their regular time. PSJA ISD will delay Wednesday’s start by one hour. Middle schools will begin at 8:30 a.m., followed by elementary schools at 9 a.m. and high schools at 9:30 a.m. Bus routes will be delayed by one hour as well. Employee are asked to verify their start time with their supervisors. Donna ISD will delay the start of Wednesday classes by one hour. Elementary schools will begin at 8:45 a.m. and secondary school at 9:30 a.m. Buses will run one hour later than usual. Staff are to report 30 minutes later than their usual time. South Texas College will also have a late start Wednesday with all STC campuses delaying opening until 10 a.m.
Any change of hours will be announced via email and social media. Weslaco ISD will delay the start of Wednesday classes. Elementary schools will begin at 9 a.m., middle schools at 8:45 a.m. and high schools at 9:15 a.m. Buses will run 45 minutes behind schedule. Classes will be cancelled Wednesday at Vanguard Academy campuses in Alamo, Pharr and Edinburg. Regular class time will resume Thursday at 8 a.m.
Mission CISD officials cancelled classes for Wednesday. The Mission CISD Board of Trustees meeting scheduled for Wednesday is cancelled and will be rescheduled for the following week. On Thursday, schools will open on a two-hour delay. Classes will begin at 9:45 a.m. for elementary schools, at 10 a.m. for junior high schools and 10:15 a.m. for high schools. All bus routes will run two hours later than normal, and school will start two hours late. School administration and custodians should report to work as close to the regular times as possible on Thursday, and the remainder of campus staff should report to work at 9 a.m.
Mission CISD administration offices will open Thursday at 9 a.m. The school day on Thursday will end at regular times. McAllen ISD will delays the start of school, according to a news release. Instruction times are 9:30 a.m. for elementary, 9:40 a.m. for middle schools and 9:50 a.m. for high schools. Bus pick up time will run 90 minutes behind schedule. Campus staff is expected by 8:30 a.m.
Release times will remain the same. Edinburg CISD is delaying the start of school Wednesday. Elementary schools will start at 9 a.m.; middle schools at approximately 9:25 a.m. and high schools at 9:50 a.m.
District and campus staff are to report to work by 8:45 a.m., according to an Edinburg CISD news release. The district will post any late start information to its social media accounts as well as send out a district-wide voicemail to parents. Edinburg school district buses will begin pickup schedules at 8:30 a.m. for elementary schools and 9 a.m. for secondary schools. Sharyland ISD will also have delayed start Wednesday, with classes starting at 10 a.m. Buses will run on a two-hour delay. The Catholic Schools Office of the Diocese of Brownsville has cancelled classes at all campuses Wednesday. Weather problems in Houston have forced the cancellation of multiple flights into and out of Rio Grande Valley airports Tuesday morning. At Valley International Airport in Harlingen, United Airlines has canceled five flights today and tonight from Houston. Southwest Airlines is experiencing some flight delays. Airport officials said late this morning that most Houston flights are canceled or delayed although Delta Airlines and Sun Country Airlines are unaffected at this time. DHL was running two hours late and Fedex was running four hours late. At McAllen-Miller International Airport, three inbound flights from Houston have been canceled as have two outbound flights. At Brownsville South Padre Island International Airport, no flight cancellations have been listed on the airport website but outbound United and American Airlines flights to Houston and Dallas are listed as To Be Determined. “Houston Bush International (KIAH) is currently experiencing all inbound flights being held at their origin until Tuesday at 11:30AM CST,” according to the airport’s website. First Baptist Church in Weslaco, located at 600 S. Kansas Ave., is opening a warming station from tonight until Thursday, Jan. 18. Intake will be from 6 to 10 p.m. and bedding, towels, toiletries and a warm meal will be provided. Please bring identification and any prescribed medication you may need. The McAllen Nature Center will be closed from today until Thursday because of the inclement weather, according to a tweet from the City of McAllen.